As music explored more and more possibilities at the end of the 1960s and into the 1970s it was inevitable that rock and jazz would eventually cross paths. What made this different was that the impetus largely came from jazz, rather than rock. However, that wasn’t necessarily surprising, as a generation of jazz musicians had watched Americans like Miles David and John Coltrane take the music far from its origins. Highly schooled players, they were understandably intrigued by what was happening in rock, especially at the progressive end of the spectrum, and wanted to discover what occurred when they melded the two styles. 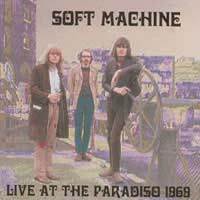 Possibly the first group and one of the most visible, to mix rock and jazz was Canterbury’s Soft Machine. They’d formed in 1963, a quartet of organ, bass, guitar and drums, all influenced by jazz and soul music, and played some of the beatnik clubs around Soho. However, it was in the South of France they found their true style, which touched on both jazz and rock, but with a Dadaist, surreal sense of humour that pervaded their first two albums. It was with their third disc, though (named Third) that they stepped boldly into jazz-rock, adding a sax player and moving along the frontier between avant-garde, progressive rock and jazz. That continued on Fourth, after which founding member Robert Wyatt, the drummer and singer, left and the group moved much more towards jazz-fusion, a trend that would take over during the middle 1970s. The group If took a more straightforward approach to jazz-rock, one modelled more on American groups like Blood, Sweat and Tears, with strong vocals and plenty of horns and guitar. However, unlike most rock bands they could also swing, and the musicians were excellent, handily able to improvise over and around themes. They only enjoyed a short life, running from 1969 to 1972 (although a couple of ragged LPs did come later), and never finding much commercial success. Colosseum developed more from the blues world ruled by Alexis Korner. It was formed by blues musicians with a strong jazz bent, led by drummer Jon Hiseman, and on an album like Valentyne Suite showed how blues worked perfectly alongside both jazz and rock. Again, they only enjoyed a brief span, running until 1971, and when Hiseman formed Colosseum II a few years later, the focus was on jazz fusion. Formed by a trumpeter (Ian Carr), Nucleus mostly featured players from the jazz world who were reaching out towards rock. Often the approach was adventurous, more dense and complex than most jazz or rock, but the albums the band released received great acclaim, although commercially they were never hits. After a while Nucleus became just Carr, although he eventually called it quits in the 1980s. Mike Westbrook worked with more traditional jazz orchestras, but with a strong sense of adventure to his music. Although he never dove completely into jazz-rock, on a number of his albums from the early 1970s, such as Marching Song, the influence of rock is quite palpable. Mike Gibbs, on the other hand, was a jazz composer who loved to mix things up. Even in jazz terms he was progressive, and happily used rock musicians as part of his recording ensembles. In that regard he was a little like pianist and composer Keith Tippett, whose free-form work found it’s best expression in the massive group Centipede, which used 50 musicians. He brought in musicians from King Crimson (with whom he’d worked) and Soft Machine for the band’s only LP, Septober Energy, a sprawling, difficult piece of work, before the group ended in 1971.